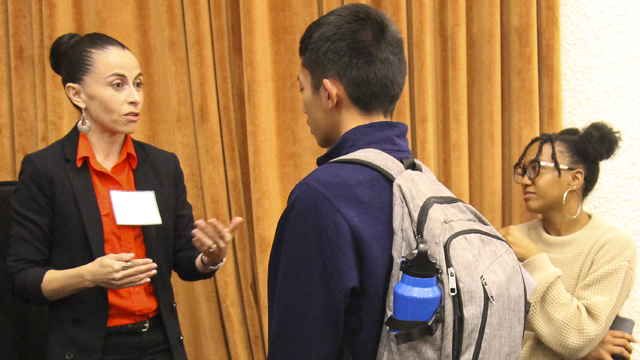 A special event during International Education Week 2018 brought together alumni of Institute academic programs and current students to discuss a variety of career paths. 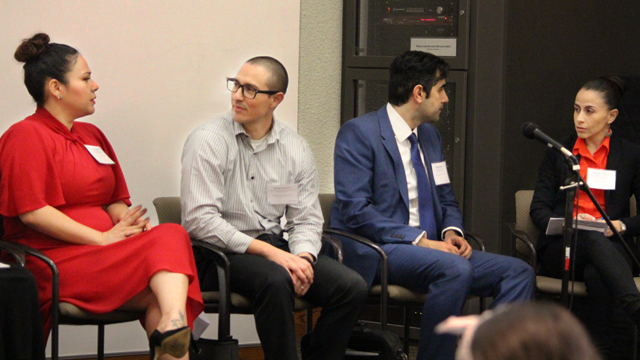 UCLA International Institute, December 7, 2018 — The first-ever International Institute alumni career panel was held November 13, 2018, during International Education Week 2018. Thirteen alumni of Institute academic programs through the years participated, either as panelists or as more informal sources of wisdom and experience for current students. 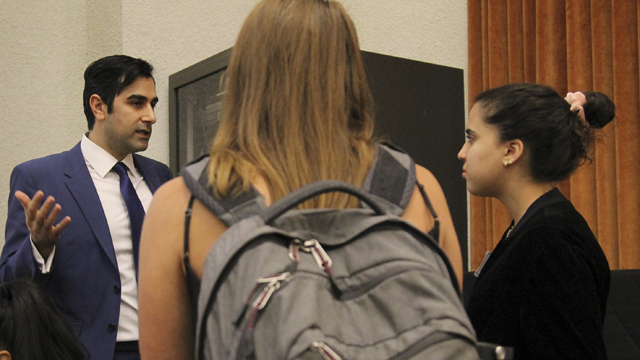 Held in room 314 of Royce Hall, the event began with a panel discussion in which several alumni discussed their career paths since graduation, which spanned nonprofit organizations, foreign consulates, the World Bank and an immigration law firm. The featured panel speakers were Deanna Cherry (development studies, 1993), president, Deanna Cherry Consulting, Inc.; Alexandra Endara (Latin American Studies minor, 2009), project management and social development consultant, World Bank; Natlie Hatour (global studies, 2012), trade and investment manager, U.K. Department for International Trade; John Q. Khosravi, Esq. (Middle Eastern & North African studies minor, 2006), managing attorney, JQK Law Corporation; Doris Quintanilla (international development studies, 2008), co-founder and executive director, Melanin Collective; and Adrián Sandoval (international development studies major/ Latin American studies minor, 2007), director, National Parent School Partnership Program, Mexican American Legal Defense and Educational Fund. 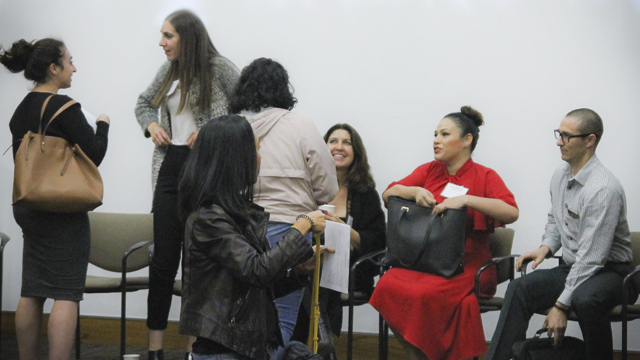 In addition to sharing their career trajectories, panelists shared their favorite memories as UCLA students and what they wish they had known when they were students. 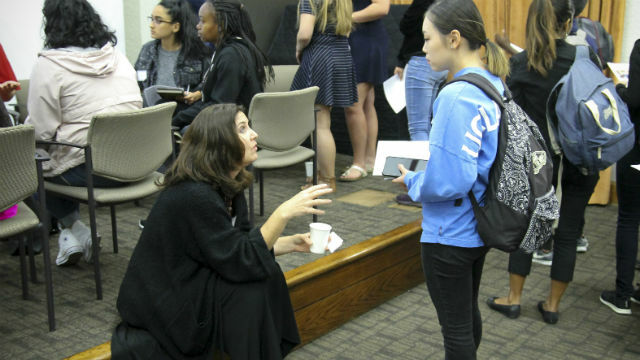 Many noted that they had not understood the value of internships and encouraged current students to use them to gain both work experience and contacts. Following their presentations, panelists and an additional seven Institute alumni fanned out into the room for a networking hour during which students were able to ask alumni about career preparation, leveraging their degrees to pursue specific career paths and how educational and career choices shaped their professional paths. 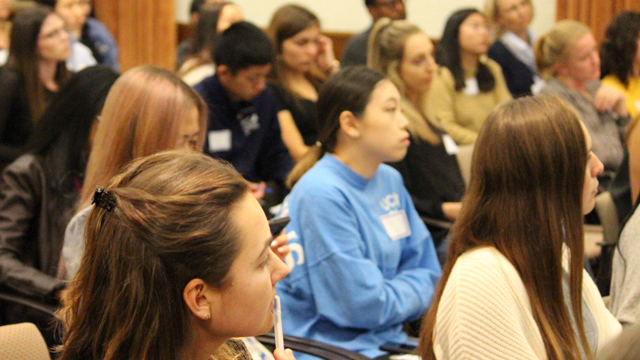 Students from Institute and other UCLA academic programs packed the room and stayed through the end of the event. In addition to helping the next generation of Bruins, alumni also enjoyed the opportunity to catch up with one another. 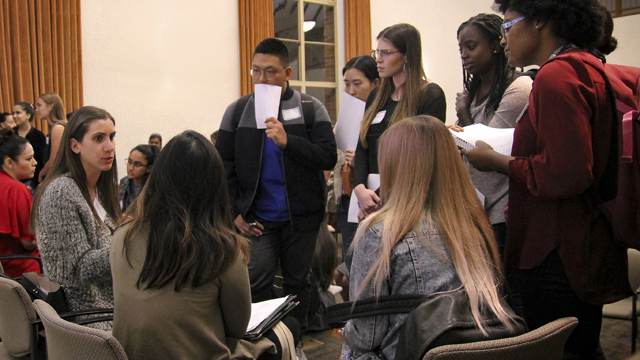 Both alumni and current students were then invited to join the signature event of International Education Week 2018, the UCLA Global Conversation with keynote speaker GSE&IS Wasserman Dean Marcelo Suárez-Orozco, which took place immediately afterwards in UCLA Powell Library. The successful event was an initial step toward greater engagement of our impressive alumni with our equally impressive current students, a collaboration that the Institute looks forward to facilitating on a regular basis. A big thanks to our wonderful alumni and students for their participation.